Hi there! 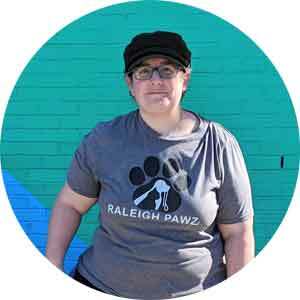 I’m Vanessa, and I’m from Long Island, New York, but I’m a longtime Raleigh resident. I’ve been in the dog professional world since 2007. I started my career at a rescue center and I’m currently a trainer and pet sitter. I believe in positive reinforcement in order to build the bond between handler and dog, creating loving, lifetime relationships. To me, they’re furry family members and I treat my charges just like I would treat my own furkids. I’m an AKC CGC Evaluator and I specialize in service dog training. I am currently partnered with my own service dog, Elwood, and we’re both owned by a trio of feisty striped felines. we spend much of our free time bouncing around downtown Raleigh and Cary, working on Elwood’s canine parkour skills.